Kevin: I know I'm spoiling the conclusion section, but dear Lord, is the textbook definition of a 2. There are two plots, neither which is terribly well done, but both are punctuated with some nice comedy or character moments. Let's start with the A plot. I always like the Nagus; he is a fun and interesting character, and watching Quark play toady is comedy gold. That said, this story just doesn't make much sense. The Prophets felt compelled to alter Zek's mind, but not say...Dukat's when he was in the wormhole? The slightly detached thing they tend to go for with the Prophets makes their even responding to Zek's presence incomprehensible. Quark's first Orb vision at least has a little more energy than your standard Orb vision, but I have no idea what information Quark was supposed to learn. The majority of the vision in the wormhole is right back to somnolent haze that make up most Orb encounters. I'm going to channel co-contributor Richard here for a second, and point out that this episode misses the point on how charity should work and the values of price in decision making. My problems with income disparity and my belief in the need for a social safety net aside, poverty would not simply be solved by rich people going crazy with charitable contributions. 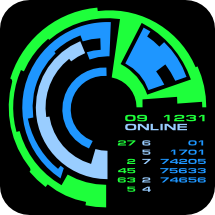 Buying everyone drinks and not caring how much high warp couriers cost would quickly bankrupt Zek, and then what position would he be in to help people? Wouldn't it be better to find a balance between getting goods to people quickly while caring about how much it costs to make sure as many resources go to help people as possible? My point is that the understanding of the problem of Ferengi greed and the solution to social ills is a tad two dimensional in this episode. Matthew: I want to learn about the Ferengi. If nothing else, the good writing work done on Quark by the DS9 has rescued them from the utter ridiculousness of their portrayal in TNG. But folks, this isn't the way to do it. Kevin is right on in criticizing the prophet/orb angle on the story. I suppose it acts as a catalyst to present two differing visions of what the Ferengi ought to be. But since it is such an artificial catalyst, it saps the story of actual drama an turns it back into a comedy. There is no conflict between two actual visions of the Ferengi, and neither are truly fleshed out. Instead it is one guy against an entire society, none of whom seem to have any problem with the status quo. I wanted to see a robust conflict between a philosophy of greed and one of... what was Zek's new philosophy supposed to be, anyway? Wholesale? Kevin: In the plus column for this, we did get some pretty damn funny and fun character moments. I liked Rom standing up to Quark in his own quarters, and for some reason, Quark licking the sides of the new Rules makes me laugh hysterically. It may well be the acting, but still, and this goes for most of the lesser Ferengi stories, but I always have at least some fun watching them. 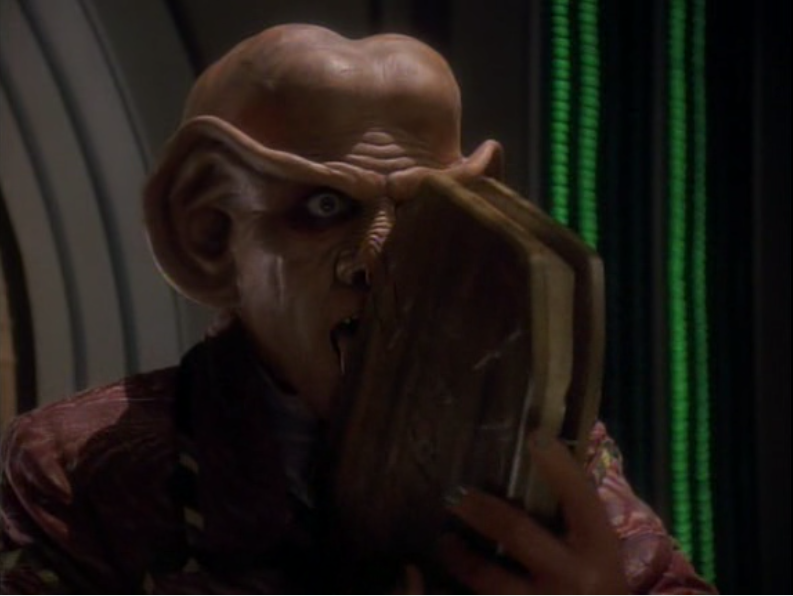 Also, Quark's speech about the virtues of greed to the Prophets is actually pretty fun, and a nice, non-absurd encapsulation of Ferengi philosophy. Matthew: It was a little thin to me. Greed as a basis for self improvement doesn't offer me much, if I have no idea what improvements are being claimed. As far as we can tell, the Ferengi are venal, hedonistic twats who alienate everyone they meet. Again, I renew my objection to this failure to really give us an interesting portrayal of a society that went a different direction than the Federation upon the achievement of interstellar travel (which, all apologies to Richard, seems to be a post-scarcity centrally planned bureaucratic state). Kevin: The B-plot...eesh. Apparently, they wrote this as a wink and a nod to the lack of acting and writing Emmys for Star Trek. I get that, but this episode is not the way to show them the error of their ways. The Nobels don't get this much hype in advance of the award. Who the hell cares? I certainly didn't. Again, we get a few nice comedy and character moments with Odo's "friend's sister's husband's etc." and the sparring over the first game of darts with O'Brien, but otherwise, I find it hard to believe a room full of doctors would muster as much actual enthusiasm as they were trying to fake. It was nice to see Bashir try to act unconcerned as it gave a little more depth to his hubris, but overall, there were no stakes and no interest for me at all. I also liked the use of the word "chirurgeon" as a title. Especially in the pre-Wikipedia days, someone did their homework on different ways of saying "doctor." Matthew: "Who cares" is the perfect summation for the B plot. I don't think the writers cared about it. Was 50% of it cut for time? It must have been. All it amounted to was "the Doctor was up for an award. He didn't win." There is no context. We learn nothing about his character, or even about his opponents. We learn nothing about the state of medicine in this future world. It was the absolute nadir of useless filler, and this in a show that's become pretty bad at it these first few seasons. Kevin: Again, not to spoil the conclusion, but this is the part of the episode that saves it from a one. Shimerman commits with body and soul as always. Watching Rom stand up to Quark was great. Wallace brings the same nasal energy to the part, and absurdity aside, him humming in the sack is comedy gold. In particular, watching Quark try to suss out the real motive behind Zek's transformation was great. Even if the plot is silly, I never thought Quark saw it that way or that Shimerman was phoning it in. Matthew: I'm debating whether Quark licking the rules is enough to save this episode. It was indeed quite funny, and was easily the highlight of the episode. His incredulity, and even shaken faith in Zek, was well portrayed. Shimerman is obviously a pro's pro. He brings both funny and serious in exactly the proportions needed, every time. But I'm sorry, Kevin, this is one Zek performance too many for me. It's stopped being funny, interesting, or anything positive. Shawn's Zek was so grating and annoying here, I turned down the volume on my set while watching. Given nothing interesting to do or say, the performance stands solely on its own. And on its own, it is fingernails-on-a-chalkboard irritating. Kevin: It was nice to see Bashir again get to be something other than a skirt chaser, and even though "pretending to not want what you really, really want even when you didn't expect to want it so much" is like page 3 of an acting textbook, I thought Siddig handled it well. The scenes of the crew alternately mocking and encouraging him were nice. The crew will never have the same rapport as TNG's cast, but I still bought all their interactions. Particularly, the scene with O'Brien played off of and built the thread of their friendship. Matthew: I agree on the basic competence of the main cast, including Siddig El Fadil. The do the best they can with what they're given. Kevin: This is a bottle show except for Zek's shuttle and the wormhole scenes. I like the shuttle. I'm not the biggest fan of the wormhole scenes. They....are...so...slow...and....hazy, it's hard not to check out. I will reiterate my love for Zek's old age make-up. When trying to age a human, it looks odd, but that many wrinkles on a Ferengi somehow really works. Matthew: I agree the prophet scenes drag, as always. But they're not as bad as orb scenes! When you have two entire classes of scenes that regularly appear in episodes, yet that no one wants to see, I think you have problems that directors or production staff should address. Kevin: I am going to shock everyone by giving this a two. Both plots are silly and/or undeveloped. That being said, in both plots, we got some nice acting and some nice comedy or character moments that keep this well above Move Along Home territory. That makes this a textbook 2 in my (text)book. Matthew: I've talked myself into a 1. I acknowledge that there are some aspects of the show that aren't terrible. The same could be said of Move Along Home. Hey, even Hitler loved animals. But the total is so much less than the sum of its parts, and Zek is so irritating, that I feel I have to consider it as occupying the bottom decile of Trek. It's not so bad it's good (e.g. Spock's Brain). I just don't want to watch it (e.g. Move Along Home, Dark Page, The Thaw.) That makes our total a 3.